BAGHDAD, Iraq (CNN) -- An explosion at a makeshift soccer field near Ramadi, injured at least 25 people Tuesday, U.S. and Iraqi officials said. There were conflicting accounts about the number and seriousness of the injuries and whether there were fatalities at the field west of Baghdad. 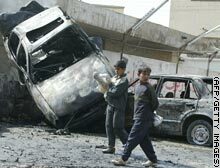 Iraq's Interior Ministry said that a car bomb at the field had killed 18 boys, ages 10 to 15. But a U.S. military spokesman told Reuters that a controlled blast near a soccer field in Ramadi slightly wounded 30 people, including nine children. Maj. Jeff Pool told Reuters the U.S. military was unaware of the attack described by Iraqi officials, saying: "I can't imagine there would be another attack involving children without our people knowing." Pool said the wounded had cuts and bruises, adding there had been no deaths from the controlled blast. The soccer field incident followed bombings in Baghdad at a popular ice cream shop, a parking lot and a restaurant that killed eight people and wounded 24 Tuesday. Iraqi police say they believe new security tactics are forcing insurgents to shift bombing attacks away from parked cars in the streets to alternative locations. The U.S.-Iraqi security crackdown forbids parking cars on Baghdad's main streets. In the ice cream shop attack, a suicide car bomber slammed into the store in central Baghdad's mostly Shiite Karrada district, killing five people and wounding 10 others, according to an Interior Ministry official. In the city's Tayaran Square, another bomber hid explosives inside a restaurant, where the blast killed two people and wounded eleven, the official said. In a separate attack, Iraqi police said a car bomb blast Tuesday in a parking lot in the Karrada district killed one person and wounded three others. In addition, a mortar round landed on a residential neighborhood Tuesday in southern Baghdad's Abu Dshsir district, killing two people and wounding six others. Authorities said Tuesday they arrested a suspect in the attempted assassination of Adel Abdul Mahdi, one of Iraq's two vice presidents. Mahdi received minor injuries in Monday's attack during a celebration at a Baghdad meeting hall. A bomb planted under a chair near Mahdi killed at least 12 people and wounded more than 40 others, including two ministry officials. The suspect was directly involved in the attack, said Laith Shubbar, head of Mahdi's media office. The U.N. Assistance Mission in Iraq on Tuesday condemned the attack and congratulated Mahdi "on his safe and immediate resumption of his duties." The attackers have been thought to be Sunni extremists targeting government officials. Mahdi is a member of the Supreme Council for the Islamic Revolution in Iraq, a powerful Shiite political group that's a major component of Iraq's ruling United Iraqi Alliance. U.S.-led coalition forces seized 12 suspected insurgents Tuesday in raids throughout Iraq. The U.S. military said the coalition raids netted an emir with al Qaeda in Iraq and 11 other suspected insurgents in Baghdad, Mosul, Tikrit, Ramadi and Falluja. The suspects included three of the emir's "associates," according to the U.S. military. All of the detainees are thought to be involved in the making of roadside bombs. Two detained in Baghdad have "alleged ties" to the al Qaeda in Iraq network, the U.S. military said. Two arrests occurred in the northern city of Mosul. Troops seized two people with suspected links to a key al Qaeda leader who is suspected of coordinating "attacks against Iraqi security and U.S. military personnel," the military said. In Anbar province, a suspected insurgent was arrested in Falluja, and another was arrested in Ramadi. In the Salaheddin provincial city of Tikrit, two people were detained. Sixteen people described as members of "rogue" Mehdi Army cells were detained Tuesday in Baghdad's Sadr City by special Iraqi army forces, the U.S. military said. The Mehdi Army is the militia loyal to anti-American Shiite cleric Muqtada al-Sadr. Iraqi troops targeted people "who allegedly control multiple rogue ... cells and illegally direct and perpetrate sectarian murder, torture and kidnapping," the U.S. military said. Bombings in Iraq have killed four U.S. soldiers during the past 24 hours, the U.S. military said on Tuesday. Three of the soldiers were killed and another was wounded Tuesday by a roadside bomb that exploded "while conducting a route clearance mission southwest of the Iraqi capital," the military said. A fourth solider was killed and two others wounded in an attack on a Humvee on Monday, the military said. The soldiers were serving with a unit of the 13th Sustainment Command (Expeditionary) near Diwaniya in southern Iraq, the military said. The number of U.S. military personnel killed in the Iraq war stands at 3,160, including seven Defense Department civilians. The U.S. ambassador to Iraq plans to attend a regional conference next month in Baghdad with representatives of Iraq and its six neighbors, including Syria and Iran, an American diplomatic official said Tuesday. The conference aims to discuss how Iraq's neighbors can support the country's government through security measures and diplomacy. Iraqi children walk past the site of a car bomb attack Tuesday in Baghdad.